France has long been called “The Eldest Daughter of the Church” because she was the first nation founded by barbarians to accept Christianity after the Roman Empire fell. We know there were Christians in France centuries before Clovis, King of the Franks, was baptized on Christmas day in 496, but his acceptance of Catholicism would shape the history of Europe from then on, leading eventually to Charlemagne, and the Holy Roman Empire. Most of the other Germanic tribes at the time had been infected by the rampant Arian heresy, so we can thank God (and his wife St. Clotilde) for Clovis’ acceptance of Catholicism, for the history of Christendom might have looked very different had he also embraced heresy. Despite the demonic horrors of the Masonic French Revolution, which would sweep France some 1,300 years after Clovis’ baptism, spilling the blood of so many Catholics, the Church in France has been a fruitful branch, bearing the beautiful and fragrant flowers of so many saints and religious orders. The roots of our own religious order, the Poor Clares of Perpetual Adoration, trace back to Paris, where we were founded in 1854 by Mother Marie de Ste. Claire Bouillevaux and Fr. Bonaventure Heurlat, a Capuchin priest. Joséphine Bouillevaux, who was, providentially, born on the Feast of Corpus Christi in Maizières-lès-Brienne, was raised in a devout family, devoted to the Holy Eucharist. The parish Curé, Fr. Jean-Baptiste Heurlat, who had founded a school in Maizieres, also felt called to begin an order of nuns who would be attached to his parish. Knowing that Joséphine, a teacher at the school, desired to lead a contemplative life, he began to form her and the other teachers in the religious life, helping them to live according to a common rule. Joséphine had been inspired by the Gospel account of the ten lepers in Luke. After healing ten men afflicted with leprosy, only one of them returned to thank Our Lord. Her heart was pierced by this ingratitude, and the words of Jesus, “Were not ten made clean? Where are the other nine?,” lead her to say, “Is it not right then that His Eucharistic love should be glorified by unremitting thanksgiving?”. This guiding principle would later be evidenced in the motto of our order: Deo Gratias Per Jesum In Sanctissimo Sacramento! Thanks be to God through Jesus in the Most Blessed Sacrament! Following the call to ever greater perfection, Fr. Jean-Baptiste entered the Capuchins, taking the name Bonaventure. Before his entrance, he told the Father General of his desire to found a religious community of nuns, and was given the support of his future superior in achieving this goal. He was invested in the Capuchin habit in 1851, and one year later received the vows of Joséphine Bouillevaux as a Third Order Franciscan, giving her the name Sister Marie de Sainte Claire. Two years later the newborn order was transferred to the city of Troyes (providentially, this city was the birthplace of Pope Urban IV, who had established the feast of Corpus Christi as an official feast day of the Church in the 13th century). That same year, 1856, permission was granted for perpetual exposition of the Blessed Sacrament, which the order has continued ever since. In 1899, having received official approbation as a religious order from Pope Leo XIII, the community was established as a Congregation of Pontifical Right, with the privilege of solemn vows. From France, this Franciscan vine spread throughout the world, and today we have monasteries in Poland, Austria, Germany, the US, India, Bangladesh and Kazakhstan. The love of Jesus in the Eucharist is a fragrant flower which spreads its sweet scent across the world. We pray that our life of adoration in a spirit of reparative thanksgiving continues to bring grace to the world and all who live in it, whom we lift up to God in prayer each day. On this Solemnity of the Immaculate Conception we gratefully recall that the Most Pure Virgin is not only our Mother, but also our model, protectress and guide. Each sister of our order receives a new name at her investiture in the habit, and this always include some form of Mary. As the adorer and contemplative par excellence, we turn to her in everything, and she teaches us to remain faithful and close to Jesus in all things. We are privileged to begin here on earth, what we will spend eternity doing in heaven: adoring and contemplating God. 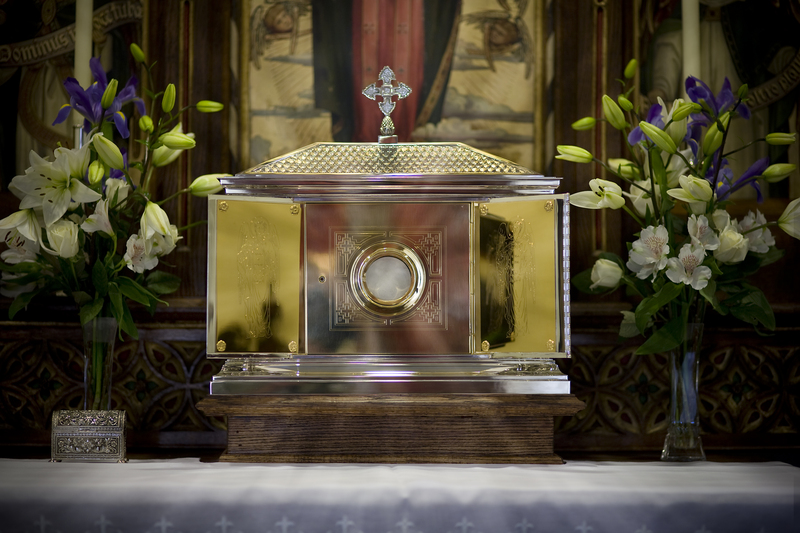 In our tabernacle, He is hidden, but in eternity we shall finally see him Face to face. Adoremus in Aeternum, Sanctissium Sacramentum. Let us adore unto eternity the most Holy Sacrament!